The problem is, Oscar-worthy content doesn’t always equal Oscar-worthy literacy. As my favorite writing joke says, “I do my best proofreading after I hit send”. Yeah, we’ve all been there. No matter how experienced at content writing you are, you still trigger the same backlash once in a while. 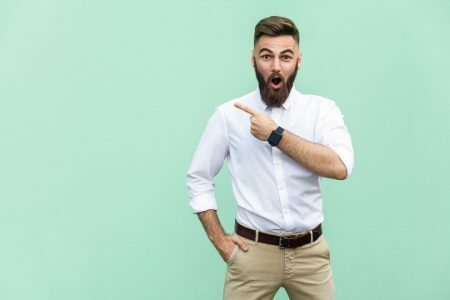 Editors don’t give a damn about your copy because, you see, they find typos (well, yes, s**t happens), awkward grammar constructions (hey, and what if it’s my awesome writing style? ), poor punctuation (oh, really? does anybody still care about Oxford commas? I LOVE them, by the way), and so on. With that in mind, you don’t stop improving your writing and editing skills, and looking for blogging tools to help you become a better content creator and get more clients. To help you out, here are 10 of the best blogging tools. Grammarly is my favorite grammar checker that will find a typo even if there are no typos in your text. After all, it’s you who decides to change it or not. It will find your structure, grammar, spelling, and style issues, suggesting for effective vocabulary alternatives. It will correct improper formatting, comma splices, wordiness, incorrect compound sentences, and more. Both free and premium versions available. Pros: Unlimited number of documents to create and save, 250+ checks, relevant corrections for personal blogs and 30 other document types. Cons: Most features are open to premium members only (plagiarism check, vocabulary enhancement, and professional proofreading, for example). Free members can see the number of advanced issues in their writing, but Grammarly won’t suggest corrections for them. 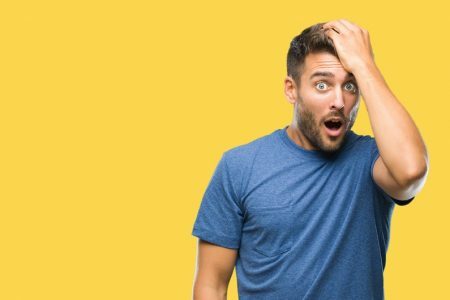 Tip: Don’t hurry up to buy a premium membership if you are not sure whether it’s worth trying. Just click advanced issues to find out what mistakes you have in a text (see the pic) to edit it accordingly. Hemingway is a savior for bloggers who don’t have the time and desire to download anything to their laptops (like me). It will check readability, grammar, and punctuation of your content, suggesting alternatives for making your writing more concise. Hemingway App hasn’t approved my text! The reason? My sentences are… long! Yeah, if you decide to use this tool, forget about long sentences with compound punctuation, as the app will never approve them. Like Ernest Hemingway himself, by the way. Pros: It’s free to use, inspiring, and inviting to the eye. Plus, Hemingway is smart enough to scan text for the most common mistakes. Cons: It doesn’t let you use adverbs and passive voice. Yes, at all. So, forget about them to make your writing concise. And yes, forget about long compound sentences. Hemingway will consider them hard to read, suggesting to consider a simpler alternative. For me, the biggest con of this tool is the inability to find ALL typos. Thus, it didn’t see anything wrong with redability, choise, adverds, and consise. Tip: Don’t use it if you are a fan of long sentences. But with today’s blogging expecting concise writing, Hemingway might be your #1 choice. 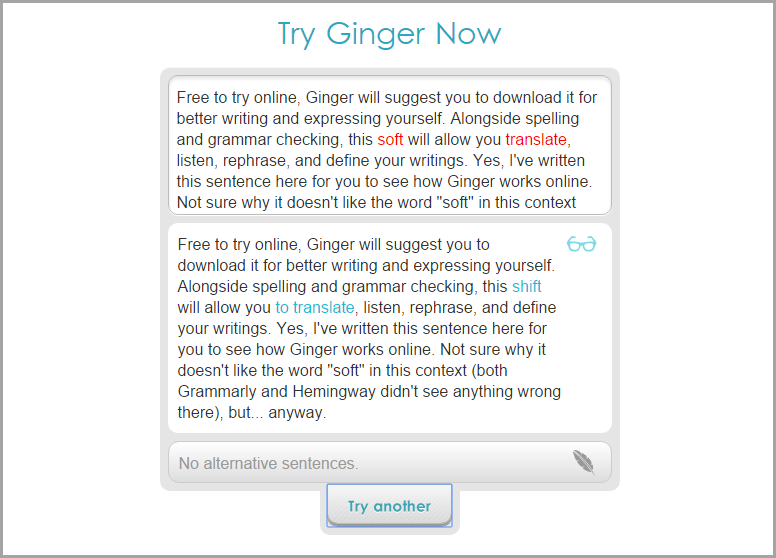 Free to try online, Ginger will suggest to download it for better writing and expressing yourself. 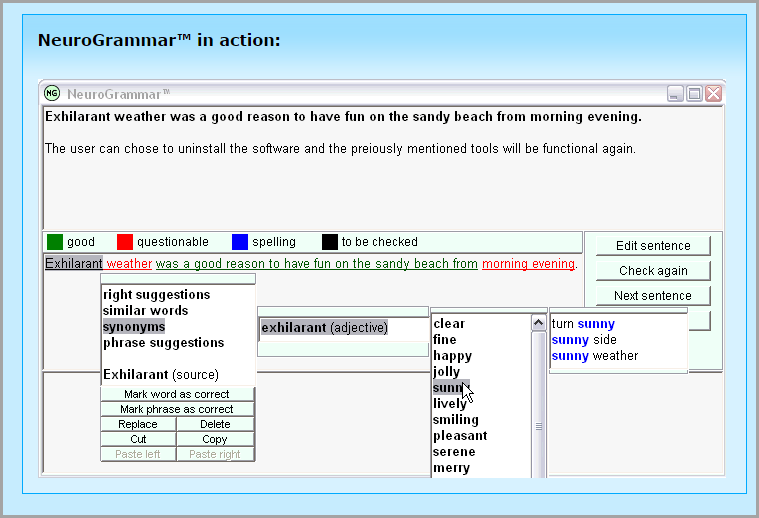 Alongside spelling and grammar checking, this software translates, listens, rephrases, and defines your writing. Pros: Free to download, it corrects grammar, spelling, and misused words. Also, it offers suggestions for alternative sentence structures. Cons: Sometimes, it corrects items that shouldn’t be corrected (see the pic), but you can always decide whether to apply this change or not, can’t you? Tip: Download Ginger to get access to all features, as it’s not practical and comfortable to use it online. Do not download it if you’ve already downloaded Grammarly, for example, as they both work in your browser and disturb each other, confusing you. Based on your audience, Atomic Writer improves such aspects of writing as word and sentence complexity, paragraph density, post length, spelling, and grammar. Developed for bloggers, it’s downloadable for browsers, as well as WordPress admin panels. Pros: It lets you track your content performance! 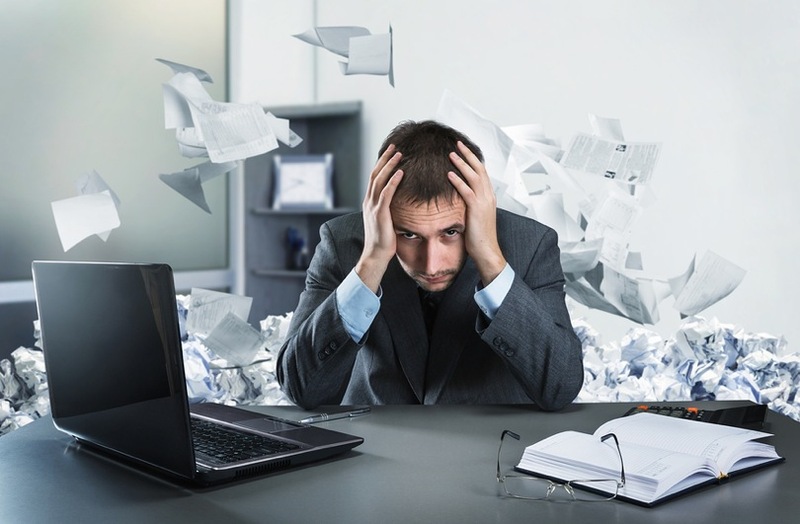 Analyzing your titles and copy, it tells you how your text works for your target audience. 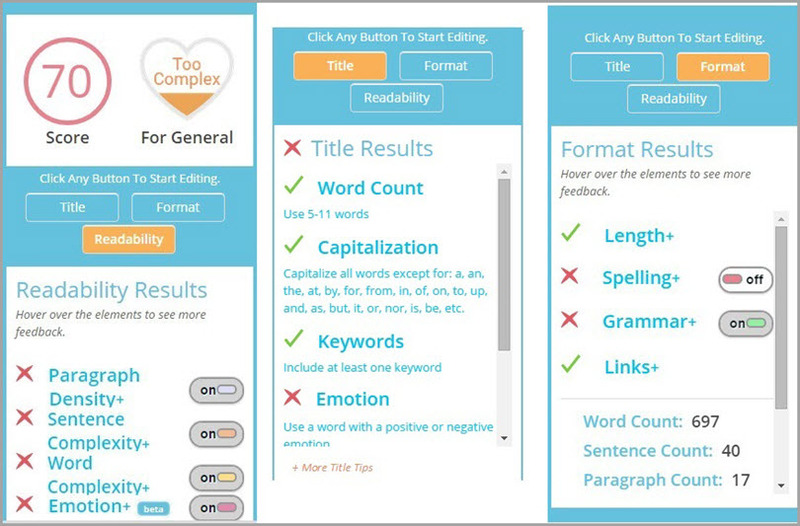 Links, emotions, audience engagement – this app helps to write better for different readers. Cons: It works best for those writing in admin panels of WordPress, Drupal, Kapost, or Joomla. If everything you need is checking your spelling, this app won’t be your best choice. Tip: Download their Chrome Extension (it’s free!) to get a clear picture of who is who. Pro Writing Aid promises to improve readability of your writing (Isn’t it what every content writer wants, huh?) and eliminate errors from your text. It’s free to use for registered members, and it stores preferences, tailoring algorithms to your writing style. You can use ProWritingAid as a plugin for MS Word, Google Docs, API, Google Chrome, or Scrivener. 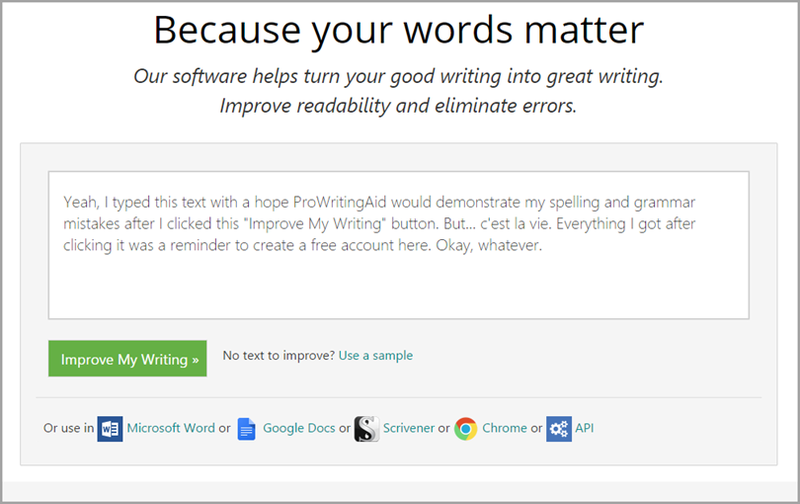 Pros: Easy to use, this tool eliminates the most common spelling and grammar errors. Cons: Impossible to use online if you don’t have a ProWritingAid account. Every step you take leads to a “Create a free account” page. The free version has a limit of 19 writing reports and 3,000 words maximum. To get interactive editing and plagiarism check, you would pay $35-$40/year. Tip: Use your social media account, Facebook or LinkedIn, to sign up and try its features. No need to share your email unless you decide ProWritingAid is of your interest and needs. 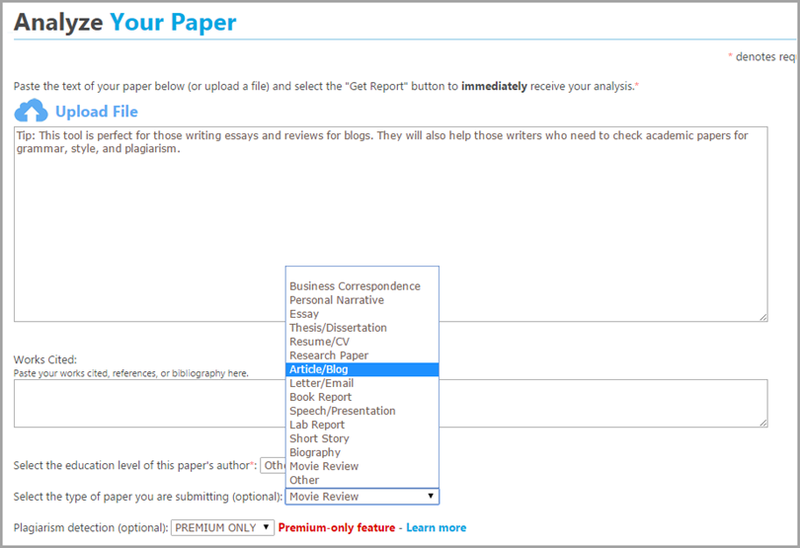 Aiming to help students with academic papers, Paper Rater can assist bloggers, too. Proofreading, vocabulary build, plagiarism detection, title validation, style and word choice analysis, readability statistics, spelling and grammar check – these features help you please editors with high-quality content. Pros: Free to use, Paper Rater utilizes indexes of all search engines. Its vocabulary builder helps you learn proper usage of words. Immediate analysis of your documents makes this tool a must-try. Cons: Most features are available for premium members only (enhanced plagiarism check, ad-free, files upload, etc.). They ask to send them your text if you want to see a report, so it can take some time to get feedback. 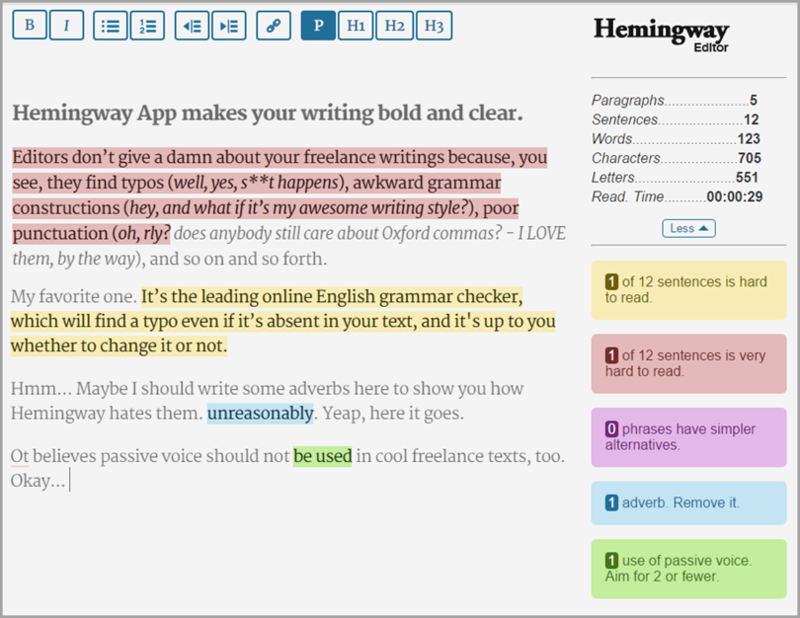 Tip: This tool is perfect for those writing essays and reviews for blogs. They will also help writers who need to check academic papers for grammar, style, and plagiarism. As a blogger, sometimes you have to work from everywhere. Literally. 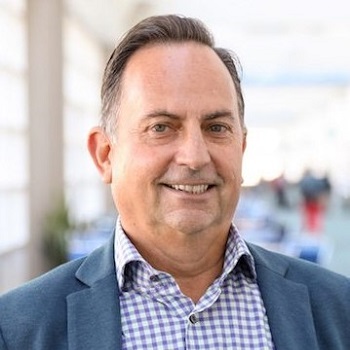 This is a reason to try White Smoke, a software that works on all devices, whether it is a computer, a tablet, or a smartphone. Allowing you to correct grammar, punctuation, and sentence structure, this tool proudly identifies itself as “the most advanced software available”. Pros: It has mobile versions for both Android and iOS. Free to use on Chrome, it does plagiarism check, text translation from over 45 languages, and writing style improvement. Cons: You have to provide your email address to get a free trial. When used online, White Smoke doesn’t explain mistakes or suggest corrections. Neuro Grammar is an advanced grammar checking software for those looking for their writing mistakes explanation, not simple demonstration. While most tools find typos, grammar fails, and punctuation fiascos, Neuro Grammar explains WHY it’s a mistake and what to do to avoid it in the future. Its advanced artificial intelligence algorithms analyze every phrase in detail. Pros: Dictionary and thesaurus. 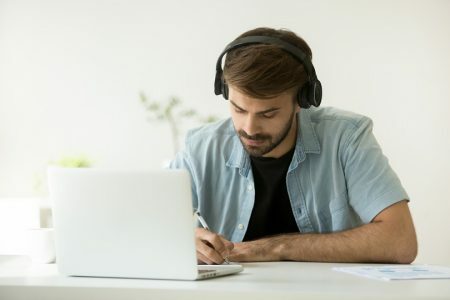 This software analyzes the meaning of your writing, provides word choices, suggests improvements regarding clarity and conciseness, and shares grammar explanations. Tip: Using this software you can add an unlimited number of your words and phrases to develop and increase its vocabulary database. 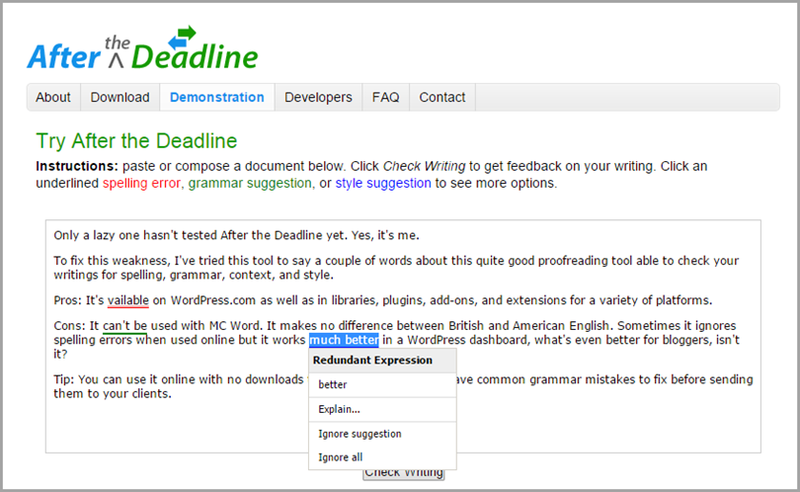 I’ve tried After the Deadline and checked its powers to proofread writing for spelling, grammar, context, and style. Pros: Available for WordPress.com, as well as libraries, plugins, add-ons, and extensions for a variety of platforms. Cons: You can’t use it with MS Word. It makes no distinction between British and American English. When used online, it sometimes ignores spelling errors but works better in a WordPress dashboard. Tip: Use it online with no downloads to check common grammar mistakes and fix them before sending copies to your clients. Those tools are badass despite their tiny drawbacks. Nobody’s perfect, after all. So, choose your favorite and hone your writing to perfection! I could not leave this Hateful Nine (sorry, I just LOVE this movie) alone. Why? I love writing long lists of 20+, 50+, 100+ items, and I love odd numbers. Here come 12 more tools and resources, worth trying to clean your content and make it error-free. SpellChecker lets you fix spelling, grammar, and works as a thesaurus online. You’ll access basic and advanced checks, but if you choose an advanced one it will redirect you to the Grammarly application. Grammar Check lets you fix writing for typos, grammar, and punctuation, suggesting alternatives for making your text more concise. It’s able to format your text and improve readability for online users. Available online, it doesn’t ask you to download anything. Language Tool lets you check content in different languages. Choose a language, paste your text, and check it for typos, grammar, and context. The tool provides suggestions for edits. Online Correction will find basic grammar, stylistic, and spelling mistakes in your English text. Choose a dialect (British, American, Australian, New Zealand, or South African), paste your text into the box, and see if your writing needs edits. P.S. It was able to find my typo in “Zeland” though Grammarly didn’t see it. Whoa! Proofread Bot provides nothing new but spelling and grammar checks online. But they confess there is a chance a bot can’t see ALL errors, so they suggest you submit content for more precise examination. Available for MS Word, Google Chrome Docs, WordPress, Drupal, and even Facebook to avoid mistakes and not feed the trolls. Oh, one more thing: it doesn’t like short sentences, suggesting you maintain an average sentence length of 15 to 20 words. Hemingway wouldn’t approve it, I guess. Correct English checks writing for grammar, mechanics, word choice, and organization. They offer three days of free trial with a following complete edition for $120. It’s perfect for those writing research and academic papers, as this tool also guides with APA and MLA styles. 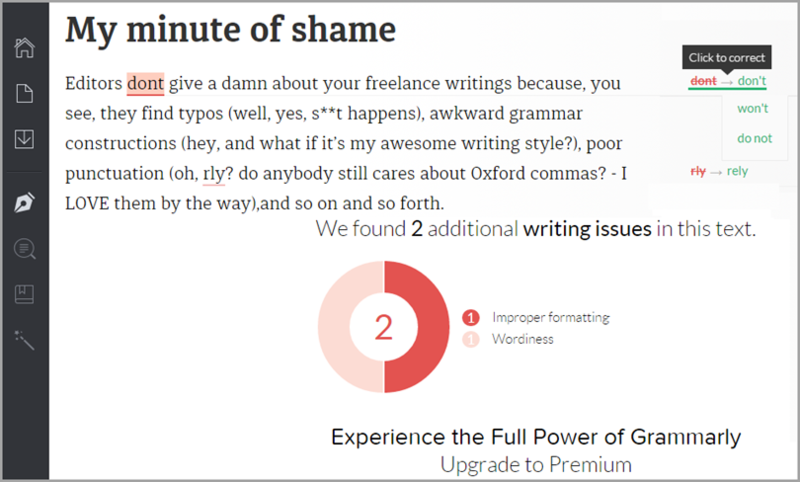 Autocrit helps check your writing for typos, grammar, and punctuation mistakes. Yes, again. It’s a tool of your choice if you write fiction stories for online publications. It needs at least 200 characters for analysis, so you can’t check separate sentences here. 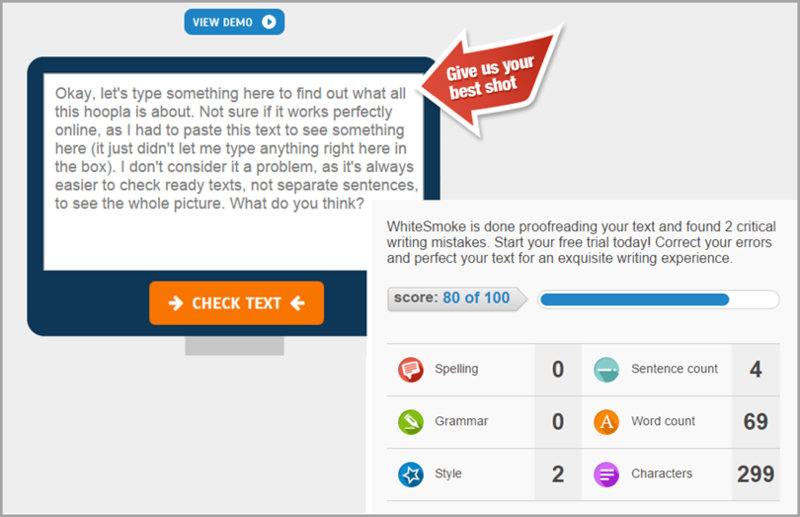 Virtual Writing Tutor is a free online grammar checker that cleans all spelling, punctuation, and grammar mistakes. Paste your text into the box to see corrections. It’s for you if you need a quick check of phrases or grammar constructions. Slick Write checks your writing online. Its distraction-free interface lets you write faster and generate better ideas. As well as most checkers of this type, Slick Write corrects and explains grammar and punctuation, as well as spelling mistakes. 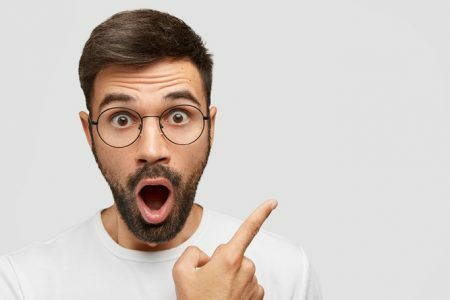 Reverso lets you check between British and American spellings, suggests several corrections, provides synonyms and definitions, and shares examples of word or phrase usage. You can use it online with no downloads. Gram Mark helps with the most common grammar mistakes all writers do, such as wordiness, passive voice usage, run-on sentences, transitions, etc. It doesn’t fix everything, warning you about that at the website. So, it’s you who decides if it meets your expectations. SpellCheck24 helps with spelling and grammar, explaining your mistakes and suggesting alternatives. It is free to use online, but you should register and create an account at their website to use all the features of this tool. Don’t give red pen police any chance to discredit your writing. Don’t give them any chance to prevent you from publishing your work at top blogs. And don’t hesitate to ask the mentioned tools for help! Spelling and grammar mistakes have never been easier to kill, and your writing endeavors have never been easier to accomplish. Guest Author: Lesley Vos is a content creator of Bid4Papers, passionate guest blogger, and ghostwriter. Specializing in data research, content creation, and distribution, she doesn’t forget to polish her writing skills and learn all secrets of content marketing. Follow her on @LesleyVos to say hi and read more works of hers.